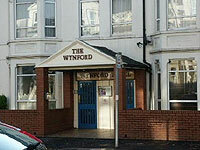 The Wynford is a family run hotel located very close to the city centre. It offers single rooms, twin rooms triple rooms, family rooms and party rooms (especially targetted at stag and hen parties). Each room has en suite facilities and a TV. There is both a bar/restaurant and a hotel night club (Club Rumours). The Wynford's location makes it an ideal base for exploring Cardiff city centre.